Children of the Good Samaritan Home in El Fayum, Egypt, play on a swing. Spring has officially arrived — and so has the Spring 2016 edition of ONE, which features a fascinating photo essay by Msgr. John E. Kozar, from his recent trip to Egypt. The image here is just one of the delights to be found in the magazine. Check out more in our digital edition. And take a moment, too, to watch this video preview of ONE from Msgr. Kozar. As we entered the mud house, we were welcomed with a warm smile by Jerry, whose mother, Elsa, is a client of Jesuit Refugee Service. Elsa was lying down, exhausted. Her daughter was working on the dough for ambasha, a local variety of Ethiopian bread. The hut contained little — just a few cooking materials and two beds made of mud attached to the mud floor. Though tired from her rigorous daily routine — which includes collecting firewood every day for cooking in an ongoing struggle to keep her three daughters fed — Elsa warmly welcomed us, insisting on offering us coffee. As we talked over our coffee, we were surprised at her optimism. We were also delighted at the work J.R.S. had done in keeping Elsa’s spirits high despite her very difficult life as a refugee. Elsa’s face brightened as she told us about Jerry’s performance at a J.R.S. program for music and the performing arts at the camp. From an early age, Elsa told us, Jerry had proven to be a talented dancer and performer. Now in her mid-30’s, Elsa explains that she herself had a great passion for music and dance when she was young, and is delighted to see her daughter share that passion. This was one of the reasons behind Elsa’s determination to hang on to life — J.R.S. has helped her keep her hopes alive. Elsa’s daughter Jerry is one of the many young people living in the Mai-Aini Refugee Camp taking classes at the J.R.S. program for music and the performing arts. Besides music, J.R.S. is also engaged in providing five other types of psychosocial support for children. These programs, which benefit not only the children, but the extended families living in the camp, include counseling, sports and recreational activities, theater and library services. In spite of the desolation in Mai-Aini, Elsa dreams of a better life for her children. Read more about Elsa’s Dream in the Summer 2014 edition of ONE. 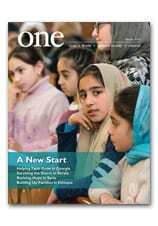 The spring edition of ONE magazine is here! Meet a Georgian hero, tour Egypt with Msgr. Kozar, meet Ukraine’s future leaders, see CNEWA in action in northern Iraq, and learn about Ethiopia’s need for water. You’ll find all of this — and more — in the spring edition of ONE. Pope appeals to leaders to open borders to migrants (Vatican Radio) Pope Francis has reiterated his appeal to State leaders to open their doors to migrants. Speaking during the General Audience in St. Peter’s Square the Pope said “I like to see leaders who open their hearts and their doors” to the many migrants fleeing their countries. Flora Sargsyan, project manager for Caritas Armenia, works to assist Armenia’s elderly. CNEWA has long had a concern for the poor and marginalized people throughout Eastern Europe, and works with religious and lay agencies to provide support where it is most needed. Despite years of work experience, Armenia’s elderly find themselves in hard socioeconomic situations in this post-Soviet period — deprived of jobs and a steady income while trying to live on miserable, inadequate pensions. Unfortunately, their situation has worsened with the massive migration of young people seeking jobs outside the country, leaving their aged parents alone and helpless. The elderly encounter a lot of hardships; some can’t take care of their health needs, or even handle the routines of daily life. It is a challenge for them just to survive in their late age. They need support — physical, material, psychological and spiritual. The initiatives we implement are intended to improve their quality of life. We work to help those who are physically and mentally frail to be integrated into society and to be treated with respect and care. We provide an array of supportive services conducted by social workers, medical nurses, caregivers and volunteers. Each time I visit the people we serve, I feel I need to offer them encouragement. Most are alone and have lost hope. They are anxious for our visits; they long to engage with others, to speak and to be heard. The elderly need proper hygiene, clean homes, hot meals; they also need medical care and attention. This is what our programs help provide. A caregiver or nurse might help bathe the patient or offer to cook or clean — even dress their hair. Our caregivers are vital to the elderly because they soothe their pain — both physical and emotional. They help ease the sufferings of their souls. Read more about Flora’s heroic mission here. Pharmacist Falah Ahmad distributes medicine to displaced Iraqis from the back of the mobile clinic. The clinic, supported in part by CNEWA, is a lifeline for thousands of refugees. Read more about it in Health on Wheels in the Spring 2016 edition of ONE, now available online.